Smart City Brake Support – All new models now come with Smart City Brake Support, an automatic emergency braking system, along with blind spot warning and cross-traffic alert in the rear. It’s a great safety feature designed to reduce pedestrian collisions and improve blind spot monitoring. G-Vectoring Control – This unique Mazda feature puts more weight on your front wheels and it’s responsible for Mazda’s reputation for vehicles that handle corners with ease. G-Vectoring Control now comes standard with all models. Trim Levels – Sport, Touring Premium, Grand Touring, and Signature trims are back, with advanced safety features standard on higher trim levels and options on lower. The Grand Touring trim gets bonuses like 20-inch alloy wheels, an aluminum trim inside, heated second-row seats and steering wheel, and adaptive headlights. The Signature trim, at the top of the line, comes with all-wheel drive standard and some deluxe features, including a rosewood interior trim and LED grille lighting. 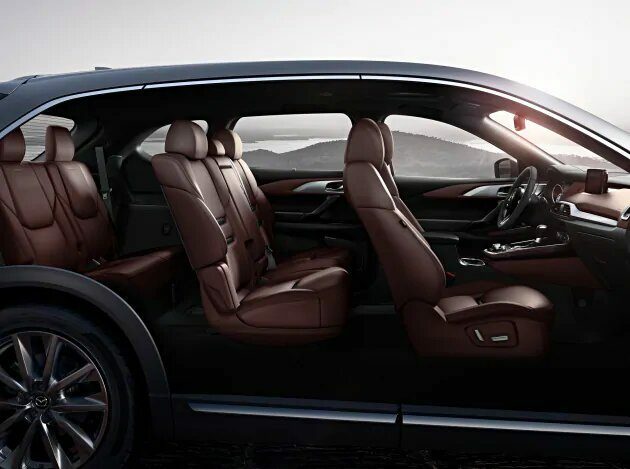 Next year’s CX-9 looks to be a solid purchase for families – with the ability to seat up to seven. But if a full-sized crossover isn’t for you, there are plenty of other options in our lineup of Mazda cars. Stop by Yorkdale Dufferin Mazda and we can take you on a tour of our showroom. We’re always happy to answer any questions you may have about new or older models, in addition to our used and certified pre owned Mazda cars. We’ve always got monthly deals going on, so be sure to ask us about how you can save more money on your next Mazda in Toronto. As your local Mazda dealership in Toronto, the team at Yorkdale Dufferin Mazda pride ourselves on always bringing you the latest and greatest Mazda cars at a great price and with great service. In addition to our huge inventory of new and used Mazda cars, we also make it easy to get into one with our financing programs and trade in options. You can even apply for approval on our website, with a safe, encrypted form, so that when you walk into our dealership, you don’t have to wait around for approval. When you considerfinancing for your new Mazda, go with us for great rates and convenience. It’s our job to put you in your new car at the lowest possible price.